So you are here for searching the best large breed puppy food for your sweet puppy, aren't you? Well, we might help you on that. Not all puppy foods are same. The puppy food commonly found on the market is for small or average breed puppies with a balanced of necessary nutrition. Those foods are not ideal if you have Labrador, Husky or Golden-retriever. Those giant breed puppies are fast growing and much more energetic. Their muscles, skeletal and digestive system close pretty much to an adult dog. But you cannot give them adult dog food either. So what is the solution? The solution is best puppy food for large breeds. The growing development of a large breed puppy needs high protein, fat, fatty acids, folic acids, Vitamin supplements and other minerals. If dog nutrition not suitable according to his age, weight, etc. he might suffer from obesity, bloat, orthopedic, and skin disease. The simple way to maintain the proper growth of their body and avoid sickness is proving a balanced diet. If the meal is ok, your puppy will be more than all right. You may think what do we call food to the best large breed puppy food? It’s food which your little dog finds palatable, meets is all physical needs and natural digestive. Plus the food needs to be extra good to improve their immune system as well. It will not update their stomach and keep the motion stable and regular. Many types of large breed puppy foods are found in the market. Manufacturers have many thoughts and theory to prove they only have the best. Later we will talk about some well-known brands and types of puppy food formulation in forthcoming section. Some say raw ingredients are best, some belief in a right mix of natural ingredients and supplementary diet of vitamin and minerals. Commonly different types of animal meat (lamb, chicken, duck, bison, fish, etc.) are used as the primary protein source for a dog or puppy food. Next chicken meal, turkey meal, etc. also add to balance the protein percentage since they have high protein percentage. And finally, it comes to add some green and colorful fruits and vegetables. Fruits and vegetables are an excellent source of vitamin, minerals and dietary fiber. Carbs are an essential part, but it considers proper when the percentage is low. Puppy food contains a low amount of rice, oatmeal, potato, barley, etc. to provide carbs but zero grain. Grain-free meal decreases the amount of starch and carbohydrate form the food. If you found in level about soy, corn or wheat- they are not grain-free food. These are used as fillers which your puppy might be allergic to. Puppy food is not fitting for one-size to all like the bowels, collars and beds/ Giant breed dogs need a particular meal in their puppyhood because of their unique nutritional needs. So, what are the fundamental difference between a regular dog food and large puppy food that make a straight line to prohibit the usage of these substantial breed puppies? Well, here is some explanation for your guys. The Large breed puppy foods are different from regular puppy foods due to their lower level of calcium and phosphorus. Large breed puppy food has carefully balanced calcium and phosphorus level to maintain proper skeleton structure. Feeding your puppy a balanced formula cannot deny the risk or bone and joint disease entirely, but it can help a lot to maintain the healthy bone structure. It’s a crucial factor for any breed of dog to provide enough calories to meet their needs according to the age. You can overfeed him or keep him striving. Also, growth rate directly affects calories. Calorie or energy comes from protein, carbohydrate, fat in food. But overfeeding them or providing food with high calories will occur rapid growth. The fast or unnatural growth of the pup may lead to bone and joint pains due to the extra body weight. Large breed puppies have the potential for rapid growth but overpowering it with excessive energy will cause nothing but harm. Regular puppy food consists of high-calorie amount compare then the large breed one. But the large breed puppy food, on the other hand, has less fat, low carbs and a decent amount of protein for limited the energy intake but maintain the proper growth. Ingredients like potato, rice, oatmeal, etc. that provide carbs come into verity in large breed puppy foods. But in regular puppy, they follow the “less is more” motto. Regular dog foods are grain-free but very low in carbs level too. The top brands of large breed dog food around the world are shared below. These brands offer the best adult, senior, and puppy foods that provide a high percentage of nutrition with the best quality. One of the most significant pet food company Acana has a large verity of pet foods that is another name of trust for many dog lovers. In our previous top 10 large breed dog foods review article you will found some more option from this brad. However, Acana produced balanced diet for every pet according to their life stage and possible body needs. When it comes to ingredients, no other company is fancy like Acana. They select and collect the best food ingredients from around the world. Like, Acana large breed puppy food is loaded with wild-caught flounder, free-run chicken, nest laid eggs, rice, potato, tapioca and many other ingredients. 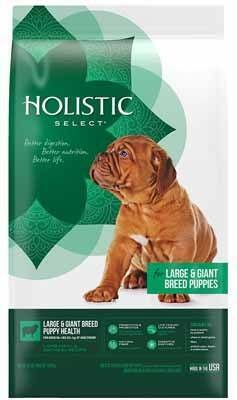 Holistic Select is reputed brand name of pet food industry. They involved in producing nutritious pet food that is quite popular around the world. For puppy foods, they have Holistic Select Small & Mini Breed Puppy Health and Holistic Select Nourish Puppy Health. They also have other diets for senior and adult dogs. This brand uses protein-rich ingredients like chicken meal, brown rice, oatmeal, pork meal, dried beet pulp and many more. Orijen large breed puppy food is quite a favorite among dog lovers. They usually use ingredients like chicken, whole herring, turkey, walleye, salmon, fish oil, chicken organs, chicken meal and fresh fruits and vegetables for their best dog food for large breeds. Eagle Pack is offering a range of nutritious and tasty meal for your dog on his different age group. They made pet food marinating a quality standard and balanced nutrition. Their products consist of many essential ingredients like Browned brown rice, pork-meal, lamb, chicken, turkey, dehulled barley, fish oil, etc. Some of the best dog foods of this brand are as follows: Eagle Pack Large and Giant Breed Adult, Eagle Pack Original Chicken-Meal and Pork-Meal, Eagle Pack Power Adult. We have looked some basic and essential facts that are good for choosing the best type o﻿f﻿﻿﻿ ﻿dog﻿ foods form a quality brand. By feeding them a best possible meal, you will ensure their longer and a better life. Here are all important factors you should consider to choose the best breed puppy foods. At present, consumers is more aware of the quality of a product and their right. Reading customer reviews or feedback could be your weapon to judge a product. Also, many studies (either positive or negative) can point the type of a product it is. So customer reviews are quite helpful on that. It’s a reliable option to find which brand is better more. If you have a picky eater puppy then finding the right flavor of the meal is little tricky. You may need to change a couple of brands before final stick with one. Also, some puppies lost appetite after feeding 3/2 times. We would suggest when starting a new brand or flavor try the smaller packet to see the result. Also, you can blend it with his previous favorite food or mix wet and dry food. It has been said puppies who have tried different flavors in his early life stage become less fussy in future. Choose the brand and stick with it which he prefers most. After finally got a puppy meal the next thing is to observe its effects on your furry friend. He might be excellent with flavor, but it does not affect well on his overall health. How much food could work, sometimes depend on the bread of a puppy, his physical condition? If your puppy has sensitive stomach or allergy problem, you might start seeing action in short time. But if the food has low nutrition level or not easy to digest you will see results after a while. It is a tricky option in that case because not all cheap products are worst and not expensive products are best. You have to look at the big picture before making any decision. We admit that most of the favorite brands are bit pricey. If any brand or product meets almost all your expectation, then don’t be a penny pincher if you can afford it. However, always concern with a veterinarian to get the professional opinion about your puppy and what kind of food he needs. Let’s take a look at ten best large breed puppy foods that have right nutrition balance. We tried to gather necessary information as much we can see which will make your search a lot more easily. 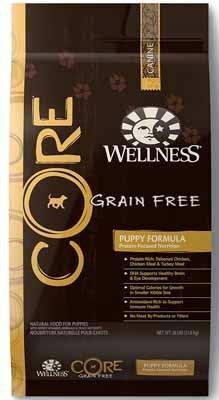 Our first pick for best large breed puppy food is Wellness CORE Natural Grain Free Dry Dog Food. This food has high protein ratio with testy formula contain with vitamin and minerals. This diet is perfect for maintaining their growth both physical and mental. Wellness CORE Natural Grain Free Dry Dog Food is made following proper recipe which ensures of all kind of nutrition hat a growing body needs. Its protein ingredient can help your large breed puppy to achieve higher muscles and leaner fat. This low carb puppy food also provides omega three fatty acids, anti-oxidant, and glucosamine. These essential elements will improve their heart, immune system and help again fight against harmful diseases. This food is made with high-quality natural ingredients like boneless chicken, turkey-meal, chicken-meal, chicken fat, salmon oil, potato, tomato pomace and many essential vitamin and minerals supplements. It also contains many fresh veggies and fruits like carrot spinach, kale, broccoli, apples, blueberries, etc. Those dog owners with picky eater puppies will find relief with is best puppy food for large breeds. Your puppy can’t resist its test and flavor and will eat more than usual. The quality of Wellness brand is out of the question. They always made the standard variety of pet products that are well-effective for the majority of pets. This one is also perfect and got many positive feedbacks. It’s safe for your tiny furry friends. There is no added artificial flavor, color, preservatives, by-products in this meal. Also, is free from wheat-gluten, corn, soy, filler or rice grain. Contains lots of fresh veggies like broccoli and spinach provides vitamin C, antioxidant, and fiber. Included fruits like apple, blueberry, banana, etc. which promote their gastrointestinal and joints. An excellent source of Omega-3 fatty acids, vitamin A, K, and D.
Improves their digestive system and make coats healthy and shiny. Has pleasant taste which your canine friend lean towards to eat more of this recipe. Due to its quality and maybe the over growing popularity, the price of the food is high. If you want to give your puppies a grain, gluten, filler, and preservative free safe and healthy diet this one is best to consider. Here is another best puppy food for large breeds which is made of unique formula to give puppies something that they would want to eat if they are in the wild. 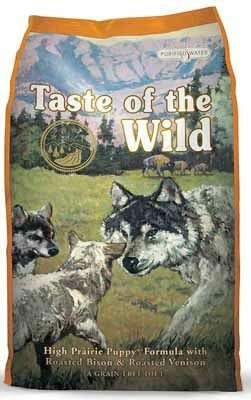 Taste of the Wild Grain-Free Dry Dog Food is made of real meat and a mix of vegetables and fruits. They use roasted buffalo, lamb meal, chicken, salmon oil, ocean fish as the protein source. This puppy food comes with two different options- High Praire and Pacific Stream. Both are grain-free. The first one is made before animal protein and the second one contains lots of fish. All they are compatible to fulfill the daily need of a large feed puppy. The difference is one provide nutrition form animal meat other is from fish. If your dog is not ok with the test of meat or have issues with that, you can try the fish one. This food boosts their energy level to last for a long time throughout the day and make them playful and happy. Moreover, its DHA, probiotics, etc. help their immune system, right on track and promote healthy digestion and regular motion. Each bowel of this best puppy food for large breeds provides a right amount of minerals and protein that ensure a healthy and balanced meal for every day. It also provides omega-3 and 6 which is rear on other puppy foods. Most of the puppy food offers only omega-3 fatty acid. But you can get this only for the marine-sourced option. It’s good for their overall skin and coat to make them healthy and shiny. Provides a right amount of vitamin C, E, and antioxidant which good for protecting from a skin infection. The recipe contains roasted lamb-meal, bison, salmon and venison meats which are an excellent source of amino-acids and protein. Contain lots of veggies and fruits which ensure necessary vitamin, mineral and dietary fiber. The price of food is high in other large breed puppy food comparison. The test of the food is ok, but some puppy may not like it of first few tries, according to some real buyer. So, this best puppy food for large breeds is good for providing balanced nutrition every day. It’s beneficiary for them for proper body and mental growth. Large breed dogs have different need compared to small breed. So does large breed puppies are? To make sure providing enough nutrition on a daily basis here is the best large breed puppy food review for you. 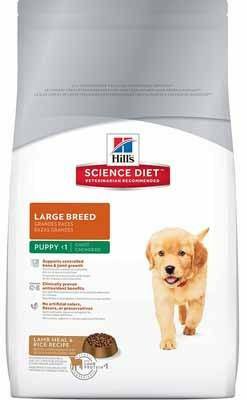 The Hill's Science Diet Large Breed Dry Dog Food is made for precisely balanced nutrition that specially designed for large breed puppies. This premium quality dry puppy food is formulated with all natural, high-quality ingredients but no artificial and harmful chemicals. This food provides glucosamine, chondroitin naturally. These two essentials work as building blocks for healthy cartilage and joints. Also, the meal is an excellent source of vitamin C and E. it has a combination of Vitamin and anti-oxidant which support their immune system and help to fight against the disease. The Lamb Meal & Rice is contained in brown rice, egg product, lamb meal, pork fat, fish oil, beet pulp, brewers rice, vitamin A, B12, etc. It also has some controversial ingredients like whole wheat, sorghum, corn gluten meal, etc. which consider bad for puppies. The thing is, the Hill's Science Diet Large Breed Dry Dog Food is made for large breed puppies 1 or one years plus and reached 55 lbs already. In this age and weight, a large breed puppy is considered a full grown small/medium breed dog. Their growing large and heavy body needs more nutrition than usual. That’s the reason they added some of these elements consciously. And the result is pretty surprising those who have to feed their puppies the diet on a regular basis. The puppies become energetic more than usual, they have had regular motion, put on weight and got shiner coat. Help to improve their bone firm providing enough calcium. Vitamin E and C also boost the immune system of your puppy and helps to against fight normal skin or health problems. Safe for their health no artificial color, preservative of flavor added. All high quality and natural ingredients used in this formula which good for balanced nutrition and also easy to digest. Some owner complains the size of kibbles are bit large for puppies it’s best suitable for puppies with one year old and more. A large body needs more nutrition than usual. That is why this good is especially suitable for growing and giant breed puppies. Those who are a fan of Wellness or familiar with this brand will be happy to know about another option for it. 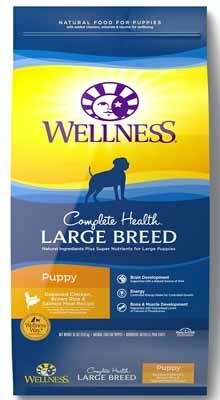 The Wellness Complete Health Natural Dry Large Breed Puppy Food is another healthy and natural option for your pups. This best puppy food for large breeds is made of carefully selected authentic ingredients different part of the world to make an ideal diet. WellPet collected most of the ingredients for Canada and USA, and around 5% of elements are imported from Australia, New Zealand, Europe and Asia. If you think maybe they are imported products from China, after all, many non-Asian think only China can provide every kind of ingredients but no quality. They have rigorous criteria of accepting components from supplier either domestic or international. Every supplier needs to meet certified nutrition level and manufacturer quality. However, this food is balanced with high protein, low fat and controlled calories. It provides amino acids, calcium, phosphorus, and DHA. That is why food for both physical and mental development is. It’s especially great for keeping up with more extended growth cycle and faster potential growth rate of your large breed puppy. This dry food is also, good for teeth, eyes, and gums. It improves their energy level and better immunity. The food contains boneless chicken, chicken meal, whitefish, Salmon meal, tomato pomace, chicken fat, Salmon oil, carrot, sweet potatoes and many more ingredients. All these are natural and free form any color, preservatives or chemical to make the food extra testy. This meal provides DHA which help to improve their brain cells. It’s containing omega 3 Fatty Acids and Taurine keeps their heat and eye health. Provides enough calcium and phosphorus for their bones and joints. Its containing Yucca Schidigera improves digestion and helps to reduce stool stink. 20% less fat compared to regular puppy food to maintain steady and paced body growth. The food is containing poultry ingredients which may cases allergy to some sensitive puppies. It also contains garlic it’s better for the food in the right amount. Wellness is top brand of natural pet food and this particular one is proven an ideal meal for large breed pups. If you want to give your puppy a healthy and testy, then there is nothing better than Blue Freedom grain-free dry food recipe. First of all its gluten-free. Second of all its contain high-quality real meat with no chicken- by-product meal that another dog food brand adds. This food work for proper and healthy body developments that promote lean muscles for large breed pups. 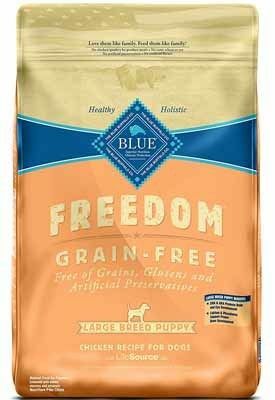 BLUE Freedom dry food is a product of United States based company name Buffalo. They have been producing quality products for many years which appreciated by many dog owner, a veterinarian who knows what quality dog/puppy food is. This puppy meal contains premium quality chicken (boneless), chicken meal, peas, chicken fat, turkey meal, Flaxseed, potatoes, carrots and many other items. Its Flaxseed is an excellent source of omega three fatty acids and 6. These are good for maintaining heart condition, blood red cells, etc. the food also provided many essential vitamins that work to fight against diseases, make their coat shiny and soft. Besides, it offers a right amount of calcium to keep the bone and joints strong and robust. This food is good to digest easily too. It has no ingredients that make their poop harder or take time to digest. So, their irregular motion (if your puppy has the problem) will be solved after starting to have this. Moreover, its light and active nutrition will make them productive and energetic throughout the day. If your dog is in training and you want him to be more active, then BLUE freedom will be a perfect option to consider. The food is good for eye development for its containing ARA. All delicious protein-rich real meat to develop their muscles. Grain-Free and out of harmful chemicals or poultry products. Contains BLUE’s particular LifeSource Bits which is the ideal balance of Antioxidants, vitamin, and minerals. Due to its consisting DHA fatty acid, it’s good for the brain and healthy growth development too. If the puppy is allergic to dried yeast, then it may cause bloating. Overall, it’s a good meal for large breed pups to not only make them strong and healthy but also make their tummy happy. Here is a premium quality best substantial breed puppy food review that’s suitable for any age of puppies. The Holistic Select Natural Dry Dog Food is made for your puppy healthy and happy inside and out. The manufacture of Holistic dry food made very their food maintaining strict quality. That’s why we can assure you about the quality of each ingredient. They use the formula chicken meal, ground brown rice, pork meal, chicken fat, Anchovy meal, fish oil, sardine meal and many more items. It has different types of vegetable and fruits which also increase the quality of the meal and provide necessary vitamin and minerals. This puppy food has a unique formula the Digestive Health Support System which composes many essential minerals, vitamin, and enzyme including the fiber. The food is also containing probiotics which give puppies’ energy and nutrition along with the improved immune system. This meal does have different types of protein meal like lamb, chicken, and duck. These are enriching with protein provides amino acids, Inulin and lactobacillus and much essential nutrition. Moreover, the feed has omega fatty acids which also keep their heart well. Those puppies that have a problem with itchy skin, joint or canine would be especially benefited with this food. First of all the food is light easy to digest though. So they can absorb the energy and nutrition from it. Also, its calcium, iron, Vitamin C, E and antioxidant work to fight against this kind of problems especially. Thus it could be a better and balanced diet in particular to normal any large breed puppies. The food is containing a high amount of digestive enzymes. Its dried beet pulp is right for their colon. Containing DHA support their brain development. No added color, preservatives, flavor, grain or fillers. Made in the USA following standard quality control and use of natural fresh premium quality ingredients. Provide enough calcium and phosphorus which good to maintain bone development and healthy joints. It contains duck meat so it may cause an allergic reaction for some puppies. Overall it’s a perfect diet for any large breed puppy. The kibbles are excellent in size, easy to chew and digest. 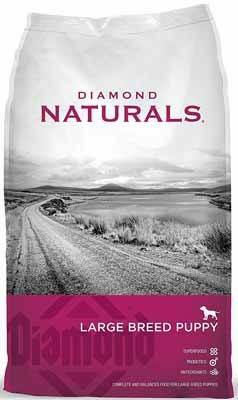 Here is another best large breed puppy food from Diamond Naturals Large Breed Dry Puppy Food. This puppy food has a right amount of protein, vitamin, mineral and other essential. The main ingredient is lamb meat. With it, they added lamb meal, egg product, chicken fat, fish meal, salmon oil, whole grain brown rice, cracked pealed white barley rice, etc. The food is containing with some amount of grain. But there is no presence of preservative color or any artificial flavor. That is why the food is most appropriate for slightly old puppies if your puppy is too small and just started to eat solid food then it might cause upset the stomach. The growing body of a giant puppy needs a right amount of carb. The existing grain and carbs of this meal is fear for their body needs. You can surely think about the diet to including in their daily menu to provide proper nutrition. The food provides a right amount of vitamin, anti-oxidant and fatty acids. The fish oil is right for their heart and supplying DHA. DHA is best known for developing brain cells and eye. Besides the food is work for developing bone, skin, coat, and muscles. It delivers a right amount of phosphorus and calcium, so they become stronger from inside with substantial bone and teeth. This food contains lots of digestive enzymes as well. That is why it helps to digest the food and maintain a better colon system easily. Contain a right amount of DHA which is helpful for their brain and eye development. Help to improve their skin texture and makes the coat shiny. It’s work to develop a better immune system and fight against the disease. Has a proper balance of fat and calories along with the protein, minerals, and carbs. The food is not so expensive but nor so affordable, pretty much pricy though. If your pups have a sensitive stomach, then they might take time to adjust with it due to consisting grain. Overall it’s excellent food for their muscles, bone and brain development. If he can adjust the diet, you may not need to think of anything else. 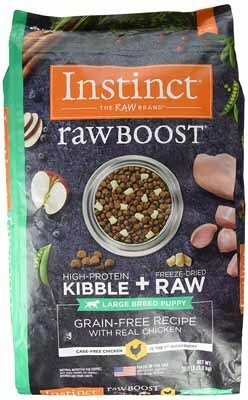 To target the potential needs of your furry friend the Instinct Raw Boost Grain-Free Recipe Natural Dry Dog Food brings its unique recipe with freeze-dehydrated meat and vegetables. Its kibbles are sprayed with a fired meat coating for enhancing its flavor. This food is specially made for large breed puppies to ensure their growing thrives. It contains raw chicken, eggs, turkey meal, herring meal, chicken peas, dry chicken, lamb meal, etc. Also, for vegetables and fruits pumpkin seeds, squash, carrots, dried kelp, apples, carrot, cranberries, etc. They collect the whole ingredient from a different part of the world. They check the entire quality standard before using them in the recipe each time. Boosting up the energy and make them active this best puppy food has Topioca. It comes from the root of a cassava plant and utterly free from gluten and grain. They use dried Tapioca which also acts probiotics which help them to digest foods easily. As a result, they get more nutrition from the menu and fight against sickness and fatigue. Enrich with high protein, necessary vitamins, and minerals. Use premium quality ingredients from around the world. The food is free form grains, preservatives, corn, potato, wheat, and soy and by-product meal. Includes DHA for eye and brain development. Low yeast and low carb easy digestive puppy meal. The price of the puppy food is high. Some owners complain that their puppies got gas and stinky breath after having the food. Providing the proper nutrition and energy in early life stage of dog is mandatory. 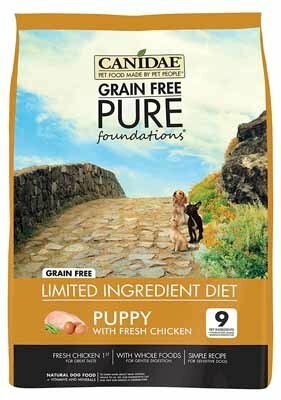 That is CANIDAE Grain Free PURE Dry Dog Food brings a well-balanced diet contains protein, minerals, carb, fats and essential vitamins but no grain. This food will make your healthy, energetic, and happy. This food supplies a right amount of calcium which helps to brow stronger bone and joints. The formula contains alfalfa which increases the calcium absorption and other nutrition into the body. Moreover, the meal consists of chelated minerals which also increase the absorption rate hugely. We all know puppies need a high rate of protein, especially animal protein to grow their muscles. This best food for large breed puppy food provides grain-free protein consumption in best ways. It offers 35% of curd protein. According to the ideal protein rate of dog food, it should be between 18-20% for mature dogs. The formula has high protein food like turkey- meal, chicken meal, lamb meat, peas, etc. items which known for extreme protein supply in any diet. However, the large breed puppy food grain free provides omega fatty acids like omega 3 and omega 6. Its consisting fish oil, Menhaden fish mean and sunflower oil is an excellent source of these two essential fatty acids. They are good for keeping their blood vessel and heat condition healthy. Here is an essential factor that you should about this large breed puppy food is, it has enzymes named Cellulase. This breakdown cellulose which is causes bowel movement issues. So it might produce loose motion or non-stop popping. So, if your puppy has a sensitive stomach, you should try it with a small portion to see the result first. A good ration of protein, vitamin and probiotics mix to makes your puppy strong. The dry food has tiny but crunchy kibble which easies to chew. No added grain, color, preservatives or by-product in this food. The test of the kibbles is testy and pretty many suits for every puppy. The puppies coat will be noticeably better. Suitable for those who have allergy issues. The food contains cellulose which may cause diarrhea. Overall, this is a quality food to try for any breed of puppies especially if he or she is a picky eater. 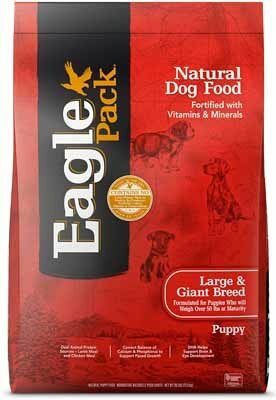 Last but not least our final substantial breed puppy food review is for Eagle Pack Natural Dry Dog Food. It has a right balance of protein, fats, and carbs. Moreover, it has some essential elements that provide vitamin, minerals, and antioxidants to ensure your puppy’s healthy growth and energy. This best large breed puppy food has ingredients like lamb meal, chicken-meal, chicken fat, oatmeal, Dehulled barley rice, salmon oil, brewers dried yeast, gowned rice and many more. With other vitamin and minerals supplement it has green tea extract and rosemary extract with provide antioxidant and added flavor to the food. This formula is researched and final with a bunch of vets and trainers to ensure your puppy got the natural fuel for everyday playing and training. It especially helps their muscle and skeletal development and along with the heart and brain condition. The calorie ration of the diet is not overrated. It keeps in balance so the puppy can’t put on weight excessively. Moreover, its consisting DHA and fatty acids support the development of their brain cells and eye well. The fat percentage of this puppy food is 9 or less. This amount is ok with regular puppies, but if your puppy has pancreatitis, then it will be an ideal option for him. Dogs with pancreatitis need max fax content in their meal. If you feed your pup in small amounts throughout the day give the pancreases time to process the fat better helping to avoid a burn from the rise. No color, preservatives, by-products, or grain are added to this food. Dual animal portions form lamb, and chicken meal helps to grow lean muscles. The flavor of the food is quite good, and most of the puppies prefer to eat. The formula can results in bright eyes, shiny coat and proper digestion with an energetic spirit. Contains DHA and fatty acids which essential for their brain development and heart. Complete vitamin and mineral package to support healthy immune system. It might increase gas problem to your pups. Eagle has been in this industry more than 25 years in the USA. It’s simple but exception formula suits well to usual to sensitive any puppies. Sometimes it's little confusing and frustrating because there are so many options, brands, etc. to choose food for your puppy. Not all puppies are same in their need or habit. So, if one meal applies for one puppy, it may not be applicable for others. You have a cute puppy, and you are devoted to him to things going to work out. So, all we suggest being patient. In the best large breed puppy food reviews, we have discussed health concern, nutrition value and other significant things. All of the foods are very much cable on to keep their growth in the right manner. Especially, Instinct Raw Boost Grain-Free Recipe and Holistic Select Natural Dry Dog Food. They are a wise grain-free protein diet to maintain proper growth of larger-breed puppies. A perfect meal is a key to being physically and mentally sound and robust. There are some health issues that large breed dogs face while they grow older. So, you have to follow the same manner to find the best dog food for large breeds as well for proper nutrition in future. And for now, look at the precise ingredients and nutrients that your puppy needs vs. what your selected best puppy food for large breeds offers.